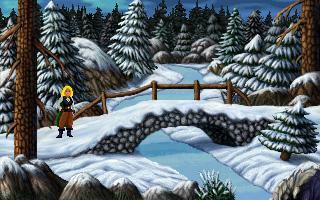 Heroine's Quest is an adventure / RPG hybrid. Like in many adventure games, you have a world to save, and must use your wit, guile and inventory to puzzle your way through. Like in many roleplaying games, you can customize your character with various classes and skills, and must train yourself in combat to stand a chance against the fierce monsters in your way. In desperation, the jarl of Jarnvidr has called for a Heroine, to stand against the forces of frost and put an end to the lasting winter. Her might, sorcery, and cunning may be humanityâ€™s last resort. Are you up to the task, or will you die trying? 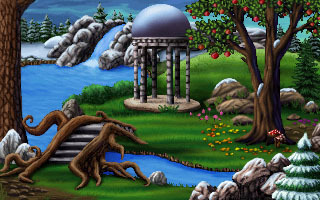 The game is designed in the spirit and atmosphere of the classics, and strives to have the same high quality of art, music, and plot. With multiple character classes and several solutions to many puzzles, the game has excellent replayability. This is v1.2.4, updated as of june 2017. Available on Steam (main download link) and IndieDB (mirror). "Exceptional quality & depth, just look at the number of AGS awards it scooped and for good reason - Heroine's Quest is a fine addition to any collection and a stalwart game of good design, mechanics and fun gameplay." The best game made with AGS. And probably one of the best adventure games of all times. I'm definitely going to buy their other games. According to the stats it took me approx. 18hrs to complete. Although developers continue to push the boundries of AGS, I really felt like this game was everything AGS originally set out to achieve. It has every fantasy adventure staple and more, for example, day & night cycle, weather, rpg style stats etc. It's quite an achievement and well worth a play... oh, and its free! Do I have to register to that ridiculous junk site to download? Do I have to INSTALL Steam to play??????? Thanks for your work, very impressive,awesome game. I was hoping to be a part of the game creation process once upon a time with this project and others. Alas, it was not to be. But it's far better without me mucking up the works anyway. I'm too amateur for such awesomeness. Lovely graphics , cool story , the puzzles are kinda annoying but that's just me. I'm not like other girls and can be very anti-puzzle. But , overall...fun game. Great game. And it's free! Thank you very much for all the hard work you all put into this. I love this game. I love you. I would pay for the next game you make but if you keep serving up things for free...that'd be awesome! You're awesome! I would love to see more games like this , especially with strong female protagonist. Please and thank you. *hugs and hi fives all around* Drinks and snacks on me. One of the best games I have played in a really long time. It reminded me a lot of Kings Quest which is one of my favorite series. I loved it! I commend the makers and hope they dream up more great games like this. This game for me was quite a showcase of quality. I feel it had elements from other games besides Quest For Glory. 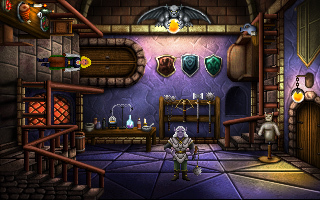 Some elements of story and features seem quite like those of Magic Candle and the Ultima series, for example. Add in some King's Quest too. Anyway, it was different enough and with good length. It's worth a play but does require quite a commitment of time. Download is huge. I'd give it 3.75 out of 5 stars. That is the best game of all AGS games. This is perhaps the most detailed, complex and quality AGS game to date! It is very engaging, thanks to some great game design and writing. The assets, particularly the backgrounds, sprites and animations are beautiful and very detailed. The music and sound effects are great too. It wasn't a game where I felt the need to turn the music off. There's some very good voice acting, though it's a bit of a mix. The complexity of making a hybrid RPG/adventure boggles the mind, but they pulled it off well, simultaneously eliminating many of the annoyances of the original games which inspired it (e.g. few/no dead-end situations, a map navigation system and an enjoyable combat system). This is certainly commercial quality. If Quest for Infamy and Mage's Initiation are even nearly as good when they are done, they will be bargains. One of the best full-length old-school point-n-click games of 2013... And this one is free! A great game. Great feeling. Great immersion. Just enough RPG to feel empowered, and just enough Point-n-click for the nice story telling and brain-using. Wat for version 1.1 though, as there are still a few [non-blocking but frustrating] bugs. Also I found the combat system to be much less frustrating than in Heroe's quest. Made in the manner of the Quest for Glory Games. Satisfying, full of secrets and details, a lot of fun to play through as any of the three character classes (warrior, sorceress, or rogue). One of the best AGS games made to date! Great game! I really enjoyed my first playthrough as a warrior and I'm looking forward to play it again as a sorceress and a rogue. In fact, I even liked it better then most of the Quest for Glory Games. Thanks to the creators! this is the best AGS game I have ever played. Period. I'm totally reliving the joy of playing Quest for Glory for the first time all those years ago - this game is every bit as good as the QFG series, if not better! Big thanks to the developers. There were a lot of great references in this game. The ending reminded me of the final scene of Trial By Fire, which I thought was a great touch. Although, I don't think I was able to help enough people! I'll definitely be trying a little harder next time, and this is certainly a game that can be played through multiple times. Heroine's Quest is a love letter to the point-and-click-adventure/RPG mix that made Quest for Glory so great. It's been in development for a long time and it shows: Beautiful graphics, balanced puzzles, actual replay value, bonus material, everything's there. This is a game that may very well set standards. Praising HQ properly would take me five times the time it takes you to download it. So do that. You won't regret it. This may well be my favorite AGS game of 2013. The production values are incredible, the story is original (it's based on Norse mythology but the way it does it feels very fresh), the gameplay is addictive and technically-speaking very impressive, and the adventure long enough for a first playthrough to be satisfying yet not too long that you won't want to do a second playthrough after it. Oh, and the bonus material is the icing on the cake. More indie games should do that. I'm really amazed at how great this game is. It's absolutely compelling. Every bit as engrossing and full of character and wit as the QFG games. I'm loving this so for and I especially like the protagonist!